A huge congratulations to Barbara M. in Kansas City for winning last week's New Release giveaway! Barbara selected Tin by Pádraig Kenny as her book. This week brings lots to choose from, so I have added a new giveaway this week. Scroll to the bottom to enter! Debut author! Disillusioned by the propaganda of Nazi Germany, Sophie Scholl, her brother, and his fellow soldiers formed the White Rose, a group that wrote and distributed anonymous letters criticizing the Nazi regime and calling for action from their fellow German citizens. The following year, Sophie and her brother were arrested for treason and interrogated for information about their collaborators. Seventeen-year-old Revna is a factory worker, manufacturing war machines for the Union of the North. When she's caught using illegal magic, she fears being branded a traitor and imprisoned. Meanwhile, on the front lines, Linne defied her father, a Union general, and disguised herself as a boy to join the army. They're both offered a reprieve from punishment if they use their magic in a special women's military flight unit and undertake terrifying, deadly missions under cover of darkness. Revna and Linne can hardly stand to be in the same cockpit, but if they can't fly together, and if they can't find a way to fly well, the enemy's superior firepower will destroy them--if they don't destroy each other first. When Aggi Frank and Max Granger finally admitted their feelings for each other last December, it felt like love was beautiful and endless...until it wasn't. A fatal car accident involving their older siblings throws their lives into sudden chaos. And with a restraining order now in place between the two bitter households, Aggi and Max's love runs cold. Being together again seems like a distant fantasy, even though they share the same driveway. Still, Plum Lake is a small town, and staying apart can't last forever. Aggi and Max eventually reunite at a lake-house party and break the ice after a year of silence. But just as they begin to rebuild their relationship, the unthinkable happens, leading them to confront each other and their families in the hope of mending the broken pieces. No matter who you are or where you come from, this book can help you define success, envision it, and make it happen—in school, in your personal life, and at work. Get ready to awaken all the awesomeness that is already inside of you. Katina King is the reigning teen jiu-jitsu champion of Northern California, but she's having trouble fighting off the secrets in her past. Robin Thornton was adopted from an orphanage in Kolkata, India and is reluctant to take on his future. Since he knows nothing about his past, how is he supposed to figure out what comes next? Robin and Kat meet in the most unlikely of places--a summer service trip to India to work with survivors of human trafficking. As bonds blossom between the travel-mates, Robin and Kat discover the healing superpowers of friendship. It's almost the end of middle school, and Charlie has to find her perfect song for a music class assignment. The class learns about a different style of music each day, from hip-hop to metal to disco, but it's hard for Charlie to concentrate when she can't stop noticing her classmate Emile, or wondering about Luka, who hasn't been to school in weeks. On top of everything, she has been talked into participating in an end-of-year performance with her best friends. Then, the class learns about opera, and Charlie discovers the music of Maria Callas. Twelve-year-old Danny O'Carolan and his sister, Kathleen, arrive in New York City in 1863. Kathleen refuses to be parted from her only remaining relative, so she finds a job in domestic service for herself and her younger...sister. Danny reluctantly pretends to be a girl to avoid being sent to the children's workhouse or recruited as a drummer boy for the Union army. When he occasionally sneaks off to spend a few hours as a boy and share his rich talent for Irish dancing, he discovers the vast variety of New York's neighborhoods. Grandpa hates being in hospital. He thinks only of the place he was happiest--the island where he used to live. He wants to go back, but they won't let him out of the hospital. So Gottfried Junior, his namesake, helps Grandpa make a plan to run away. They think of everything. Their deception is so complete that when Gottfried Junior finally decides to tell the truth, no one believes him. Illustrated. Kathrine Switzer changed the world of running. This narrative biography follows Kathrine from running laps as a girl in her backyard to becoming the first woman to run the Boston Marathon with official race numbers in 1967. Her inspirational true story is for anyone willing to challenge the rules. The compelling collage art adds to the kinetic action of the story. With tension and heart, this biography has the influential power to get readers into running. This love letter to black history in the US highlights the unspeakable trauma of slavery, the faith and fire of the civil rights movement, and the grit, passion, and perseverance of some of the world's greatest heroes. Carl the Earthworm spends his days happily tunneling in the soil until a field mouse asks him a simple question that stops him short--"Why?" Carl's quest takes him on an adventure to meet all the animals of the forest, each of whom seems to know exactly what they were put on this earth to do, unlike the curious Carl. But it's not until the world around him has changed that Carl begins to realize everyone, no matter how small, makes a big difference just by being themselves. Rather than focusing on going to bed--and what kid wants to think about going to bed?--this book explores all of the dreamy, wonderful, strange things the next day might bring. A forest doesn’t need a map to know where to grow. But people need a map to find it. And in 1882 when surveyors set out to map a part of Minnesota, they got confused, or tired and cold (it was November), and somehow mapped a great swath of ancient trees as a lake. For more than seventy-five years, the mistake stayed on the map, and the forest remained safe from logging—no lumber baron expects to find timber in a lake, after all. The Lost Forest tells the story of this lucky error and of the 144 acres of old-growth red and white pine it preserved. Once in a faraway kingdom, a strong, brave maiden is invited to attend the prince's royal ball, but she's not as excited to go as everyone else. After her mother convinces her to make an appearance, she makes a huge impression on everyone present, from the villagers to the king and queen, but she ends up finding true love in a most surprising place. Stubby was a brave soldier, a loyal friend...and a dog. From an army training camp to the trenches in France, this is the incredible true story of Sergeant Stubby, the dog who served bravely in World War I—sniffing out gas attacks, catching spies, and winning the hearts of his fellow soldiers. I can't wait to read White Rose. I love that it is in verse. We have a growing number of our middle school students who like to read books in verse. My students would love "Stubby: A True Story of Friendship!" They can't seem to get enough of the animal books. We have a Stubby book for older kids, but this one would be perfect for the younger group! 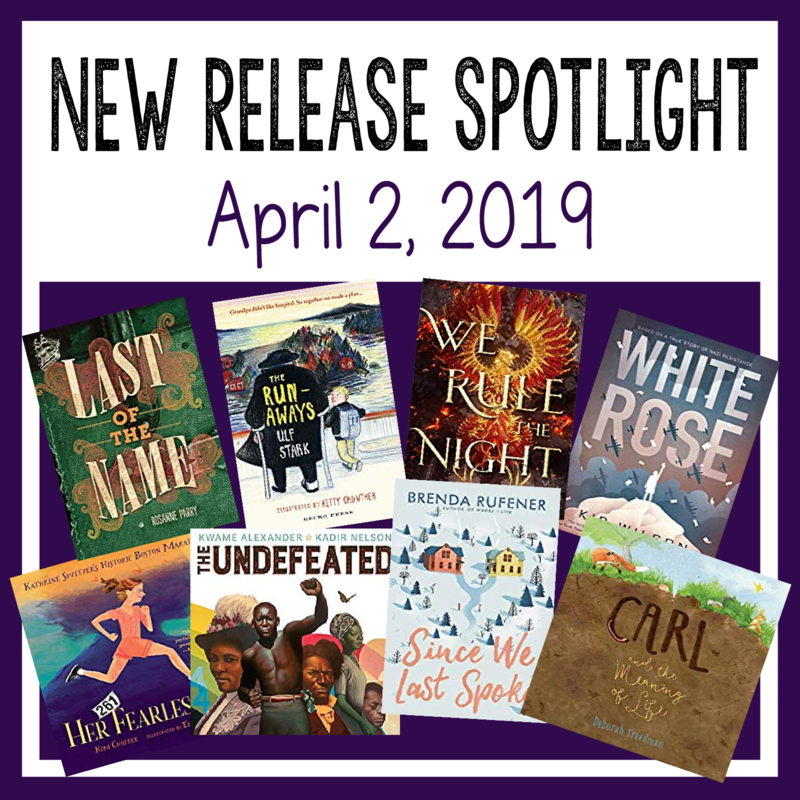 So many great picture books this week! Love it! Just ordered White Rose - should be very popular! White Rose looks very intriguing! My students (grades 6-12) love books in verse! 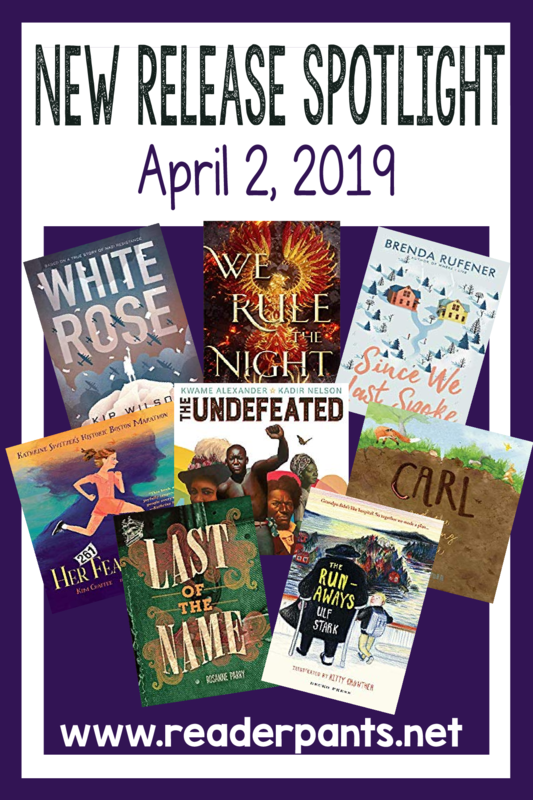 So many good books that I know students will enjoy. Anxious to see "White Rose"
Have been waiting so long for book 5 of the Shatter Me series! I think students at my school would enjoy "Since We Last Spoke" - they love a romance, and there's something a bit "Romeo and Juliet" about this one! I've got a bunch of tenth grade girls who are DYING for Defy the Fates! My students are going to enjoy White Rose. We are currently in our Tolerance/Holocaust unit and this fits PERFECTLY. We Rule the Night would definitely be very popular with my high school students!